Geography Bee season is upon us, and this year Maps.com was lucky enough to take part at grass roots. Instead of just writing about maps, geo-politics and an increasingly bizarre group of place-shaped kitchen products we elected to use our time more effectively by assisting in the early rounds of the National Geographic Geography Bee at our local school, Goleta Valley Junior High. The results were inspirational. This is the second Geo Bee we have been involved with locally in recent weeks and once again it was a delight to see kids of school age up for geography. You can read about it here at our Maps101 blog. Cross posting this from our friends at Green Comma. These elections will determine the course of the US economy, its role in world affairs, how social services are made available to the citizenry, and what the role of government should be in United States of the 21st century. These debates will be broadcast on more platforms and will be accessible to more people around the globe than at any time in world history. The first senatorial debate was between Abraham Lincoln and Stephen Douglas in 1858, without a moderator and lasted for over three hours. The first radio broadcast of a Presidential debate was in 1948 between Thomas Dewey and Harold Stassen. In 1960, the Nixon-Kennedy debate went into the history books not only as the first televised Presidential debate but also for what it revealed about a candidate’s physical presence in front of a camera that got closer to the candidate, literally, than the majority of the voters. Today, we provide a few fact-checking tools for you to use as you follow the debates. This ability to monitor and access information in real-time is part of the social media world we live in. We also we provide you with two links to the debates themselves and to an app that provides you, your children and your students with information for the entire election process. and of course, check out the election resources on Maps101. Your trusted source for classroom resources. Maps101 is a cross-curricular, online resource that makes K-12 learning engaging and fun. Ever since the iPad burst onto the scene, tablets have been the darlings of consumers and educators alike, with hundreds of millions of units sold. But is the US market indicative of the Worldwide trend in mobile platform adoption? The question for publishers and content developers then becomes how to create content and curriculum as platform-agnostic as possible in order to capitalize on the adoption of as many of these devices as possible worldwide. At the moment, there are no easy answers, especially when publishers have to reach schools that are on the front lines in adopting the newest technology as well as those that lag behind, having to make do with years-old hardware and software. At Maps.com, we are creating content and applications both specific to iOS and Android operating systems as well as cross-platform applications – primarily with HTML5. For instance, in our Maps101 Web service, we have long had a collection of hundreds of outline maps and a Flash-based MapKit drawing tool for users to create and modify their own maps. This month we released a new tool called MapSketch that adds to all of our maps an HTML5-based drawing tool that is cross-platform compatible. MapSketch will also be made available to add the same drawing tools to third party sites and applications such as Interactive White Board Activities. Contact us to find out how. “Networks: A social studies learning system” is a complete Social Studies resource incorporating print and digital solutions. The system is designed to bring abstract concepts to life through hands-on, interactive activities such as interactive maps and games, graphic organizers and engaging multimedia. The publisher included comprehensive teacher resources, worksheets, training videos, lesson plans and assessment tools. Over 600 maps were produced for the project by Maps.com Cartographers, while the company’s programming team developed a presentation platform for the digital content that included timeline animations, voice narration and editing tools for a truly interactive classroom experience. The CODiE awards are annually presented by the Software and Information Industry Association – the principal trade association for the software and digital content industries. Initial reviews are carried out by tech-savvy educators, with a shortlist of 128 finalists reviewed by a panel of SIIA members. Maps.com has more than 20 years of experience in the mapping industry and serves a variety of markets including education and news media. They have an in house development team producing location based applications including online store locators and smart phone apps and ebooks. Maps.com is also home to the world’s biggest map and map related online retail store which receives almost 1 million visitors each month. apple dropping google in cartographic celebrity divorce? According to several sources close to Apple, the new IOS6 operating system for iPhone will no longer include Google Maps, and will instead feature an Apple developed mapping service believed to be faster, cleaner and more reliable. It will also proudly boast awe inspiring 3d rendering developed by C3, a spin-off of the Swedish auto and aerospace manufacturer SAAB, which was purchased by Apple in July 2011. C3 specialized in developing 3d rendering from color aerial photography. Rumors about this change have been circulating ever since the purchase of Placebase, a mapping software developer, was revealed in 2009. Initial evidence of a split was seen earlier this year when iPhoto for the iPad was found to be using Open Street Map instead of Google Maps as in previous versions and the outcome became an inevitability when Apple failed to renew its contract with Google that was due to expire at the end of 2012. Whilst nothing has been officially announced it is expected that maps will once again be making the headlines at the forthcoming iOS6 launch. Who knows, maybe they can make some fundamental improvements like including the names of rivers in the new maps and find some of the more recently ‘lost cities’. GPS – For the love of the rain forest. People indigenous to some of the world’s most precious natural environments are helping to preserve their way of life using GPS mapping. Communities native to the world’s second biggest rainforests in the Congo Basin, for example, rely on the ecosystem for 80-90% of their resources, through activities such as hunting and fishing that they have practised for years. 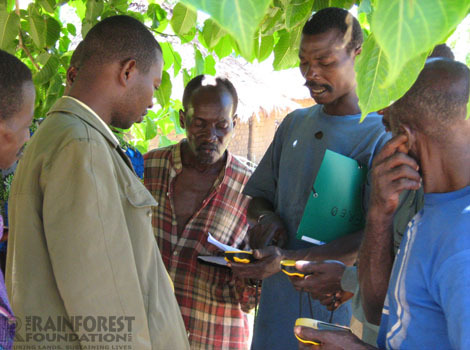 GPS training in the DRC: Rainforest Foundation. Because they are semi-nomadic, meaning that they move around the rainforest rather than living in a single, fixed location, the extent to which they live and work there is often disputed. The rainforests are under constant threat from industries such as logging and farming (both legal and illegal), so already these people are used to seeing their world shrink around them. But even conservation itself can, ironically threaten their way of life, as frequently protections not only prevent the destruction of the forest but also their right to continue their own activities there. Tribes are also enabled, using their GPS devices, to hold companies who have been granted specific rights to be held accountable when they exploit or violate restrictions that have been set upon their operations. For example more than 6000 Bantu and 1500 Pygmies are now involved in policing logging activity in the Bandundu and Equateur provinces of the Democratic Republic of Congo through participatory mapping. Organizations such as Rainforest Foundation UK have been training community members as ‘Master Mappers’ to create maps by initially sketching their homeland out and then using GPS devices to accurately locate the places on the map. The aim is to create a territory map that can be presented to the Congolese Government when they meet on May 8th to determine the future of the rain forest – with regard to parceling of the forest for industrial purposes. The government has already made 11 concessions to logging companies from several European nations. The maps will be offered as hard proof that these communities exist and live throughout the rainforest, and offer their representatives a chance to play a part in negotiations about their homeland. As reported on CNN, a similar project has existed for more than 10 years in the Cameroon, where tribes in the Boumba Bek collected honey, mangoes and medicinal plants prior to it receiving National Park status under the jurisdiction of the World Wildlife Fund. The Baka people were able to provide similar GPS based evidence and restore their right to operate within the region. GPS offers an opportunity to these indigenous peoples to talk in the technological language that those contesting their rights have traditionally used to defeat them, and provides a very portable, low impact way of preserving their way of life. Villagers celebrate completion of a community map, this time in the Central African Republic. This article was also published on our K-12 Education blog – The maps101 blog. Review: The Barefoot Atlas for iPad. Since we occasionally like to feature ‘extreme mapping’ in this blog, and recently looked at one of the hugest atlases EVER, to strike balance we just reviewed the Barefoot Atlas. It is relatively microscopic and as pleasing an example of atlas content for the iPad as you are likely to see (for now). Ebooks hold great potential for literary authors with so many distribution platforms to take advantage of. However in the Atlas market there is a distinct lack of product that really utilizes devices such as the iPad effectively. The Barefoot Atlas has been touted as one example that does. Immediately apparent to the user is the beauty of the graphics. The opening screen includes a globe and illustrations which give it an ethnic, hand made quality. The delivery of the atlas appears far from hand-made (if that were, in the field of technology, a bad thing). This book is designed to take advantage of the new retina display technology on the latest iPads and I can only say that it looked beautiful on our antique, over the hill, has-been iPad2 so be prepared to have your eyeballs singed on the new model. 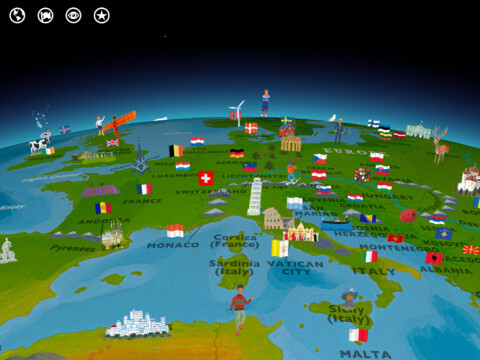 The visuals are slick, based on a 3-D globe familiar to users of Google Earth. The controls are simple – in fact at first glance the content looks sparse. Initially one can see that the globe is littered with small objects. Navigation is smooth and of course uses the touch screen and accelerometer to its fullest, in that one can increase gravity instantly by giving the earth a good hard spin. Each region has its own incidental music which appears appropriate but not stereotypical. The ‘objects’ include landmarks, historical features, monuments, cities and more. Each can be clicked for a small description with optional voice narrative. To separate out the ‘information’ sections, the book uses audio and visual effects. The background music changes to a more subtle, atmospheric sound and the screen is divided using a shaded, transparent background. A photograph of each feature is also included. 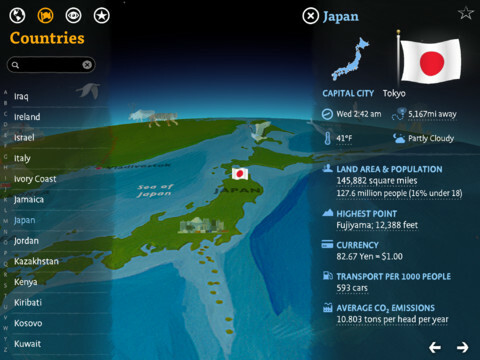 Users can also explore by region and by country. Again, each region, continent and country has its own detail page with a selection of facts and figures including terrain, climate, natural resources, environmental outlook, wildlife, transport and population. Each has a short description and optional voice narration. For individual countries, a datasheet is included to show local time, distance from your current location, current temperature and weather. Flag, outline map, land area, currency and ‘eco-indicators’ like average CO2 emissions are also provided. There is definitely more than a hint of the eco message surrounding this book. With much debate around right now about the value of the ‘whistles and bells’ that ibooks, ebooks and apps provide over and above the standard text, the Barefoot Atlas is certainly evidence for the ‘pro’ camp. The beautiful illustration and attention to detail that the background music and voice overs (from BBC presenter Nick Crane) provide only serve to compliment the appropriate level of content that is delivered. Verdict: Cool for younger children to play, great for older ones to use as a reference tool. What are you looking for in an atlas these days? Are E-books the way forward? Do you see them as taking the traditional atlas to the next level or as a gamifying distraction to educational content? What are your favorite Geography-related ebooks/apps?